Mention the Proclaimers and they'll more than likely start singing "Letter From America" or "500 Miles" in the most horrendous Scottish accents known to man and i'll let you into a secret, I more than likely would have done the same thing a few years ago before I witnessed the Reed Brothers at an intimate Academy 3 show a number of years back. To use the word intimate is perhaps a tad understated as the gig wasn't even sold out, but each and every single person in that room knew the words to every song they played and tonight's sold out gig at the Academy 2 is testament to what a devoted following and word of mouth can do for a band such as the Proclaimers. While as songwriter's they clearly look to the classics, The Merseybeat sound through to rock'n'rollers like Roy Orbison, they clearly set out for Scottish Devolution early than the rest of the country did. The Reed Brothers have always sang in their own accent rather than water down their ancestry and this is why they stand head and shoulders above other bands for some people. The fact that they're "real people" with "real life's" who simply come together as brothers to create honest and simply crafted, but classic songs, is what appeals to people. A quick glimpse at their calendar for the next couple of months shows their headlining at Aberdeen's Hogmanay above bands such as The Coral and this show in Manchester proves that their popularity is going from strength to strength in England. The title track of their new album "Restless Soul" is take on white boy soul Dexy's Midnight Runners style but it's unmistakably the Proclaimers in action and within seconds they've thrown away "Letter From America" as if it's just another song in their collection. Imagine another band throwing away one of their biggest hits so early on and the rest of their set would fail, but when you've got songs like "There's A Touch", "I'm On My Way" and "Let's Get Married" in your repertoire it's no worry. "Sunshine On Leith" shows a different side to the band and for every brash singalong chorus they have this song will bring a tear to the hardest hearts. 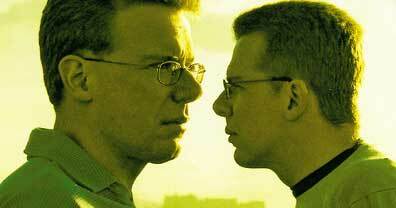 The Proclaimers may be under the radar of the media's prying eyes, but you suspect the Reed Brothers prefer it that way. With the core devotees growing by each and every tour, many converts no doubt joining that core tonight, The Proclaimers are going from strength to strength and next time they tour they'll be upgrading again. If you weren't at this show tonight by the Best Of The Proclaimers as a starting point, but I warn you once you buy the one album you'll be rushing out for more.